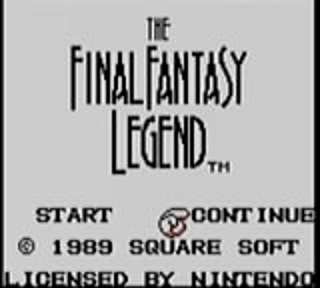 Originally released in Japan in December 1989 and brought to North America in September 1990, The Final Fantasy Legend is not actually a Final Fantasy game. As part of its English translation, this first game in the SaGa series was renamed to take advantage of the success of the Final Fantasy brand. A group of adventurers attempts to scale a tower that is said to lead to Paradise. However, to reach higher floors, the heros must find the Sphere located in each of the worlds attached to the tower. What mysteries await them at the top? Best time: Single-segment 1:07:35 by Ryan 'Poxnor' Vogt on 2011-04-16. Best time with large-skip glitches: Single-segment 0:06:46 by Ryan 'Poxnor' Vogt on 2012-05-07. Single-segment 1:07:35 by Ryan Vogt. Stefanie: my wonderful wife, for not only putting up with being an FFL-widow, but also helping me with my game notes. There are two key game mechanics that allow for a fast speedrun of this game: monster progression and the Saw glitch. Members of your party that are monsters progress by eating the meat of other monsters. When a monster in your party eats the meat of a defeated monster, it transforms into a new monster. Each monster in the game into which you can transform belongs to one of 25 families. The family of the new monster is determined by a table lookup indexed by the families of the monster eating the meat and the monster whose meat is being eaten. Additionally, each monster has both a meat level and a target level, which I denote m:t (e.g., a 6:5 monster has meat level 6 and target level 5), ranging from zero to 14 (0-E in hexadecimal). The new monster will be the monster in the new family with the largest target level less than or equal to max(m_e, m_m), where m_e is the meat level of the monster eating the meat, and m_m is the meat level of the monster whose meat is being eaten. As a concrete example from my run, a Catwoman (Family H, 5:4) transforms into a Beetle (Family J, 6:5) by eating the weak meat of a worm (Family N, 1:0). This transformation happens because in the lookup table, Family[H][N]=J, and max(5,1)=5 is equal to the target level of the Beetle. While there are exceptions, generally the target level of a monster is one less than its meat level. Hence, you can transform into stronger and stronger monsters by eating meats of the right family, regardless of the level of the meat that you eat. In addition to this abusable transformation mechanic, the other key component of a speedrun is the Saw glitch. Saw is an instant-death attack that two monsters can use (Beetle and Warrior). Saw may miss altogether; however, if it does hit, it either does zero damage or kills the enemy instantly. I assume that the programmers intended that it would do zero damage if the monster's strength is lower than the target's defence, or instant-kill the enemy otherwise. Unfortunately, someone flipped the inequality comparison -- Saw instant-kills any target that it hits where the target's defence is greater than the attacking monster's strength. The Beetle is the weaker of the two enemies that can use Saw, so it can successfully kill more enemies with Saw than the Warrior. However, the Beetle's hit rate is lower. Once you make it further into the game and the enemies have higher defence, the Warrior becomes more useful. The game programmers were even thoughtful enough to give the end boss a godly defence statistic. The final important overall note is that there are two critical dedicated PRNGs. The first is the run PRNG: it outputs a fixed sequence of boolean values (successes or failures) when attempting to run from battle. The only exceptions are fights that cannot be escaped (such as guards that you touch) and preemptive fights (which can be fled without polling the PRNG). Generally, I flee preemptive flights, except when I need to win them to manipulate the meat PRNG. The meat PRNG outputs a fixed sequence of boolean values that determine whether a given monster will drop meat when it is defeated (excepting those monsters that cannot drop meat). When two or more monsters in a given battle should drop meat, only the leftmost meat will appear. More detailed notes about the run are included below. I start as a female mutant, since she begins with a Saber that can be sold for enough money to fully equip her. It is important to get a monster transformed into an O-Bake (L, 1:0), since an O-Bake can instantly kill the P-Frog. While it is tempting to run from the Ashigaru, since killing it does not affect the meat PRNG, doing so would deplete a successful run from the run PRNG that is more useful later. I acquire two Onis (A, 1:1), who can deal significant damage early in the game. The ultimate goal of the meat transformations in the first world is to get a Catwoman (H, 5:4) into the lead of the party, since she can deal a lot of damage for this point in the game, and she will be able to transform into a Beetle during the first ascent. The guard fight on the first floor yields a Zombie meat necessary for the transformation path to a Catwoman. Had I attacked the guards on the second floor instead, the additional fight that would have happened before I could make it to the second-floor guards would have changed the enemies in the guard fight to two Wererats and one Zombie (yielding a useless Wererat meat drop, since the Wererats are further left than the Zombie). It's a shame that I have to fight the guard battle on the first floor instead of being able to fight a guard on the second floor, since the second floor of King Sword's castle is a run graveyard. The vast majority of run attempts ended in that room, with me running into one of those two guards (the moment the game begins the movement animation of a guard into a new square, the guard is considered to be in that new square for the purposes of hitting him and initiating a fight). Like most runs, this one almost ends in that room. The first guard on the second floor takes a step north and I almost hit him. Thankfully, the movement animation begins early enough for me to react to it. I get around the guard in the same number of steps that it would normally take to walk north around him, despite having to double back. I switch the first two characters before the King Sword battle to prevent King Sword from scoring a critical hit on the Red Bone (B, 3:2). The strange move of the mutant switching to her Rapier for the second attack of the King Sword battle is to manipulate the outcome of the Gen-Bu battle later in this world. I run from all of the encounters after Castle Sword until a Lizard (G, 0:0), which I need to transform the Hornet (K, 4:3) into a Catwoman (H, 5:4). I could have encountered a Lizard inside Castle Sword by walking around on the first floor before leaving, but running from encounters along the way to Castle Shield is faster. Similar to during the King Sword battle, I again make an odd-looking choice in the battle against the Steward's monsters. The Catwoman's first attack is more than sufficient to kill a Skeleton; but, using her second attack prevents Gen-Bu from casting Gas on the Oni and killing it. The Skeleton (B, 0:0) quickly becomes a Raven (Q, 4:3). The Raven can deal a meaningful amount of damage for the time being; but, more importantly, I want a Family Q monster for the Sei-Ryu fight. Walking to the right wall on the fifth floor of the tower is a simple step-counting trick to trigger the Worm battle at the last possible moment before entering the second world. The Catwoman (H, 5:4) eats Worm (N, 1:0) meat to become a Beetle (J, 6:5). The Beetle's Saw attack is not terribly useful yet, since the Beetle has such high strength compared to the defence of the enemies in this area. However, this attack will be critical to the run. The first blatant abuse of the run PRNG occurs in this world. I intentionally fail to run against the Pirate north of the second cave's exit. That burns off a false boolean value from the PRNG, and allows me to run successfully from the painful battle just north of the Airseed island on my first attempt. You will see this technique of failing to run against a weak enemy used several times throughout the run. It should be noted that it is two steps shorter to go west and south around the island where you find the floating mini-island, as opposed to going north like I do. However, it makes no difference in the scope of the run, since I have to burn off a bunch of steps in Sei-Ryu's castle to manipulate some encounters; and, burning off those extra two steps now makes step-counting in Sei-Ryu's castle trivial (by using environmental constraints to count my steps, like I did on the fifth floor of the tower). My battles and fleeing thus far were designed to line up that long string of failed run attempts with the harmless Magician battle. I manipulate the run PRNG again underwater so that I can successfully run against the powerful enemies that I will encounter in Sei-Ryu's castle. The Shrimp (U, 3:0) meat is the first good opportunity to upgrade the now antiquated Oni (A, 1:1), who becomes a Rhino (D, 3:2). The step counting on the first floor of Sei-Ryu's castle is to manipulate the battles that I will run into on the higher levels, and actually saves time. This idea, like triggering a Worm encounter on the fifth floor of the tower, is courtesy of ShinerCCC. While I initially assumed that Sei-Ryu's castle would be a run graveyard because of the Octopus guards, my route is actually quite forgiving here. I need to run from a Cactus group on the third floor, and fight an Octopus guard on any floor (after the Shrimp and Red Bone encounter); these two encounters can happen in either order. After those two encounters, I need to fight a Cactus group with the Grenades equipped, before fighting one last Octopus (without that last Octopus, Sei-Ryu will not drop meat). By chance this time, I don't hit an Octopus guard until after I get the Grenades (I nearly hit the guard that I normally pass on the left on the second floor, but double back to avoid it), so I fight my first Octopus battle prior to the mutant equipping the Grenades. The Sei-Ryu battle marks the first game-breaking use of Saw: Sei-Ryu's defence is 25 and the Beetle's strength is 19. Instant death results. The reason I wanted the Raven (Q, 4:3) in my party also becomes apparent after the Sei-Ryu (FS2, 5:-) battle. The Raven eats Sei-Ryu's meat to become a Gazer (S, 6:5), who will inflict massive damage in the coming battles on the way to the tower and during the second ascent. On the sixth floor of the Tower, I transform my Gazer (S, 6:5) using Medusa (Y, 4:0) meat into a Crab (U, 7:6), which may seem surprising given how effective the Gazer is. However, the Mantcore (W, 5:4) eats Atomcrab (U, 4:3) meat in the very next battle fought to become a new Gazer. By giving up the Gazer for that one battle, I have a Crab during the Mantcore battle, and the Crab can eat Mantcore meat to become a Thorn (V, 8:7). The ultimate goal of transforming the lead character is for it to become a Warrior (B, B:A) prior to reaching the fourth world, where Su-Zaku roams freely. First off, I cannot understate how much I hate the two vehicles in this game: the glider in the third world and the hover bike in the fourth world. I'm not winning any awards for piloting these abominations. That said, my terrible piloting of both vehicles only costs a few seconds over the course of the run. The Dragon armour that I purchase in the third world is one of the most useful defensive items in the game (second only to the Band helmet, in my opinion). It provides immunity to fire, ice, elemental, and poison magic, as well as a high defence rating. I continue to advance the lead character toward becoming a Warrior, transforming it into a Ten-Gu (Q, 9:8). As monster HP values continue to rise, the usefulness of the Gazer will diminish, so I have it eat Siren (Y, 5:4) meat to become a Crab (U, 7:6), just as the previous Gazer did -- it's a convenient upgrade path for Gazers at this point in the game, and will lead to monsters that can take more damage (and eventually deal more damage). The ultimate goal for this monster is for it to become the tank of the party. Ascending Byak-Ko's fortress is one of the most nightmarish experiences in the game with respect to NPC movement. Thankfully, the guards do not fight you if you bump into them, but they will talk to you. This area does not increment your step counter for random encounters (it is like a town), so I'm free to dodge them how I see fit. This ascent is among the luckiest that you'll ever see: not only do I not trigger a conversation with any guard, but no guard stands in any of the one-square-wide choke points, forcing me to wait for it to move. Having no need for the money, I skip taking the Revenge sword (which could be sold) during the jail sequence. I continue towards the goal of getting a Warrior (B, B:A) by having the Giant (A, A:9) eat Mosquito (K, 5:5) meat to become a Wight (F, B:A). All that is needed to become a Warrior is a cross-transformation. Speaking of cross-transformations (transformations which do not change the monster level but do change the family), I give up my Gunfish (R, 8:7) by eating Imp (M, 6:5) meat to become a Mou-Jya (F, 8:7). This transformation may seem odd for now, but the goal is eventually to turn this monster into a Family X monster (the tanks of the game). At the end of the third world, I abandon the glider outside the inn with the keys in the ignition and the windows rolled down. It's not there when I leave in the morning, and I really couldn't care less. The rationale behind transforming the Gunfish into a Mou-Jya is revealed with it eating Gazer (S, 6:5) meat to become a Ten-Gu (Q, 9:8), which is only one transformation away from becoming a Family X monster. While a Gunfish could have eaten the Gazer meat to become an Ammonite (T, 9:8), that approach ultimately leads to dead-end transformations based on the upcoming battles. The final step in creating a Warrior happens during this ascent. The Wight (F, B:A) makes a cross-transformation by eating Ant Lion (J, 7:7) meat to become a Warrior (B, B:A). The Warrior is key to making it through world four and beating the rest of the game. I equip one of the Stone books that I purchased earlier, because it finally becomes more useful than the high-damage Grenades (as enemy HP values and defence values increase). Interestingly, I kill the final enemy of this ascent, a Jelly, with Stone rather than Saw. Saw would have missed; and, any attempts I made at manipulating Saw to hit resulted in horrific fights against Su-Zaku prior to reaching the first subway. The Warrior's high hit-rate with Saw makes world four much faster, with the repeated Su-Zaku fights. In fact, the Beetle will only attack Su-Zaku with Saw once (in a battle where the Beetle gets the first attack and connects with Saw). In some fights, the Beetle will attack before the Warrior, but will not use Saw; the Beetle's Saw would have missed. I do a new kind of PRNG manipulation in the first subway. The Warrior's Saw attack would never do damage against a Stoneman. However, because I attempt the attack, the Beetle's Saw attack hits (and kills the Stoneman) rather than misses. If it weren't for the Warrior attempting to use Saw, the Stoneman battle would have stretched out to two rounds. I'm just so delighted to get another vehicle. There are two nice things about the hover bike, though. You can fly over a certain type of ruined building (the type I fly over between the subway stations on the way to Akiba, and later fly over extensively on the way back from Northeast Town to Southwest Town) without incrementing your step counter, thus avoiding numerous Su-Zaku attacks. You can similarly fly over water without incrementing your step counter (which I do on the way to the power plant). In the subways, the Ten-Gu (Q, 9:8) eats Lamia (Y, A:9) meat to become an Ironman (X, B:A). The Ironman has a lot of HP, takes half-damage from physical attacks, takes no damage from most magic, and can dish out a fair amount of damage. The party now has a tank. Finding the hidden town of Akiba is trivial, since it is directly right of my second Su-Zaku fight after the subways. It's a pleasant, if unintended, consequence of flying over all those ruined buildings. In Northeast Town, in addition to picking up up a better curative item and some armour, I sell items so that I will have just enough space for everything that I will purchase or collect for the rest of the game. Since my step counter does not increment in Southwest Town, I can fly the bike quickly without worrying about going one square too far. I even drive it inside a crowded bar. Everyone in Southwest Town will die shortly; while police suspect Su-Zaku's involvement in the carnage, my driving is also being investigated. In the power plant, I would have ideally run from the preemptive battle against the Atom Ants and Giant. However, doing so causes the Evil Eye (S, D:C) not to drop its insanely powerful meat. The increasingly irrelevant Beetle (J, 6:5) eats that meat to become a Demoking (M, D:C). The Demoking has access to the time-saving Teleport spell, a Sleep attack that is useful against some large groups, and some group-attack abilities. I leave poor So-Cho to rest in peace with his bike (it's significantly faster to walk to the skyscraper, compared to going back into the remains of Southwest Town and fighting your way to the new bike then driving it to the skyscraper). The Band helmet provides immunity to all magic and makes physical attacks do half-damage, allowing me to remove the Dragon armour and equip the Suit armour (which has a higher defence rating but does not provide the same immunities, which I require later, as the Dragon armour). It feels so wrong to ignore Su-Zaku's (FS3, C:-) meat, but it's just no use. The Demoking's teleport spell saves a bundle of time, allowing me to heal in Base Town and then warp to the tower instantly. The Demoking's Sleep spell also makes for a few easy fights on this ascent. You have to talk to the Creator on the 22nd floor of the tower before ascending to Ashura. If you do not talk to him, the re-ascent version of the tower will not load after you fall down to the new Base Town. The Demoking immediately eats the meat of Gen-Bu2 (FS1, E:-) to become a Beholder (S, E:E). The Beholder is death itself, clad in the flesh of an eyeball. Its fourth attack (Gaze) is a group-stone attack that essentially never misses (except on enemies that are immune to stone). Its fifth attack (also called Gaze) is a group-death attack, useful for enemies that are immune to stone but not to death (such as the Dragon 5 group encountered during the re-ascent). The only things that the Beholder does not destroy are the Bonekings seen during the re-ascent, as they are immune to both stone and death (and, even more aggravatingly, their defence statistic is lower than a Warrior's strength, so Saw will not work). While the Tiamat (Z, E:E) is not immune to as much as the Fireman, who ate Sei-Ryu2's (FS2, E:-) meat, the Tiamat can take a significant amount of damage. It is also immune to all the elementals (just like the Dragon armour), which is sufficient for the upcoming Boneking battles. Plus, it can do additional damage against the upcoming Bonekings. After helping defeat the first group of Bonekings, the Tiamat eats Boneking (B, D:C) meat to become a Basilisk (G, E:E). The Basilisk takes half-damage from physical attacks, which allows it to tank in the next battle against the Musasis. The Basilisk eats Su-Zaku2's (FS3, E:-) meat to become a Ki-Rin (W, E:E), who is immune to the elemental attacks used in the last Boneking fight in which I engage. The end boss has a defence statistic of 200. It makes for a very anticlimactic boss battle. Overall, I'm very happy with this run. I had great luck with NPC movement, and overall smooth execution. Despite all the jokes about my bad driving, it only cost me a few seconds in total. This run is unquestionably my personal best. When I began planning this route, I never would have believed that sub-68 was possible. I probably would have scoffed at the idea of even getting sub-75. I hope that you all enjoyed watching this run, and I hope that my comments enlightened and entertained! Japanese version single-segment with large-skip glitches: 0:06:46 by Ryan Vogt. Stefanie: for all your encouragement with this crazy hobby that is speedrunning. If the English release of this game wasn't glitchy enough for you, I hope that you enjoy the Japanese v1.0 release of the game. Two key errors present in this version that were corrected in later releases are the "stocked meat glitch" and the "2-8 glitch." While not relevant to a single-segment run, loading a saved game after powering the system on sets the stocked meat to a Fly (K, 0:0). Humans and Espers function equivalently to Clippers (J, 0:0). Undergoing a character transformation by eating stocked meat cures all status ailments, including death. The 2-8 glitch is an extension of the stocked meat glitch. If, prior to selecting the bottom (i.e., 8th) ability, you first select and cancel the 2nd ability, a buffer overflow will occur if the character in question is transformed by eating the stocked meat. The character's new character class, HP, and stats will be written to memory correctly. However, a large number of things that follow in memory will be overwritten with junk. The things that follow in memory include that character's abilities, all relevant information about subsequent characters in the party (class, stats, abilities), your item inventory, and information about your gameplay (e.g., the highest level of the tower that you have reached, what vehicle you are driving, etc.). I start as a human male, just to add to the insanity factor of the run. I could have equivalently started as a Clipper (J, 0:0), but that would have been less fun. I recruit a Skeleton (B, 0:0) and an Albatros (C, 0:0), setting the stocked meat to Albatros meat. I exit Base Town and pull up the menu as I am stepping back into Base Town. The timing on opening the menu has to be precise, because I am going to be glitched into a vehicle shortly, and I can only disembark it if I glitch into it while I am already stepping into the town. I perform the 2-8 glitch on the Skeleton; it eats the Albatros meat to become a Goblin (A, 0:0). A buffer overflow ensues, dumping junk into memory addresses including the Goblin's ability list, the third and fourth members of my party, and my progress in the tower. I go to the recruitment station and choose to recruit a new character to take the place of the dead fourth character (you can recruit a new character to take the place of any dead character who isn't the hero), but I cancel before recruiting anyone. The stocked meat is now set to be a human male. The fourth character, a Wight (F, B:A) with corrupt statistics, eats the stocked meat -- which behaves like Clipper meat -- to become a Warrior (B, B:A). You can normally only teleport to a floor of the tower to which you have already been. However, because of the buffer overflow, the game thinks that I've been as high as the non-existent 99th floor of the tower. My Goblin accesses his corrupted skills list to teleport to the non-existent 33rd floor. As it turns out, the "33rd floor" is actually the first room in the tower re-ascent. The Warrior makes good use of the Saw glitch to power through Gen-Bu2 (FS1, E:-). The Goblin eats that meat to transform into a Mazin (X, E:E), the best tank in the game. The dead fourth character, a Pudding (E, D:C) with corrupt statistics, eats the stocked Mazin meat to become a Beholder (S, E:E). The dead human, essentially a Clipper, eats the stocked meat to become an Athtalot (M, E:E). Beholders can destroy almost anything in their path. Their fourth attack is a group stone attack that essentially never misses. Their fifth attack is a group death attack, useful against the Dragon 5s who are highly resistant to stone. The only enemies that I will encounter that present a problem for a Beholder are the Bonekings, who are immune to both stone and death. A Beholder can kill most enemy groups with either the stone attack or the death attack, giving me an additional degree of freedom to manipulate the battle PRNG (since those two attacks poll the PRNG in different ways). In the battle against the one Ko-Run and two F-Flowers, I have the first character in my party, the Mazin, target the F-Flowers with an attack instead of the Ko-Run. Because the Mazin attacks after the Beholder who kills the F-Flowers, this choice eliminates the Mazin's pointless attack from the battle. I have both Beholders use their stone attack against Su-Zaku2, since the first attempt misses. I was unable to manipulate the first stone attack to hit Su-Zaku2. After I flee the single-Boneking battle, I take twelve extra steps to reach the door to the next floor. The fastest way to take twelve extra steps is to step back onto the escalator six times. The reason I take these extra steps is that the encounter rate for almost every tile on which I step during the re-ascent is 5/256. The exceptions to this rule are the floor-type tiles on the final floor of the re-ascent (the four tiles south of the door through which you enter the floor, and the single tile in front of the door through which you enter the Creator's abode). Those tiles have an encounter rate of 64/256. By taking twelve extra steps on the lower-encounter-rate tiles, I manipulate the encounter PRNG to give me fewer encounters on the final floor of the re-ascent. By taking those extra steps, I get into one random battle on the final floor; had I not taken those extra steps, I would have had four random encounters on the final floor. Full credit for this manipulation goes to Nitrodon; I had previously been taking two extra steps to manipulate the encounters on the final floor down to two, before Nitrodon discovered that I could instead take twelve steps. I hope that you enjoyed this run, and that my comments were helpful in explaining what was happening in the first few minutes. I'm pretty amazed that I got this run when I did -- I was in non-serious mode, drinking whisky and chatting with my Twitch chat channel. But, Essentia taught me to have the DVD recorder going always, even when you're just practicing, and I'm glad that she did. The final time that I was able to get shocked me; I guess that just goes to show how terribly glitchy this game is!